I hope you’ll take a few minutes to look at the annual letter that Melinda and I just published (gatesletter.com). This year we make the case that in the next 15 years, life will improve faster for people in poor countries than it ever has before. I’d like to sign off with one last plug for the Annual Letter, www.gatesletter.com, and my blog, www.thegatesnotes.com. A shorter chair every decade I am afraid. According to one test we just ran at the office, I’m getting a download speed of 65.96 Mbps and uploading at 12.41 Mbps. Hi Bill, my question: Is there anything in life that you regret doing or not doing? I feel pretty stupid that I don't know any foreign languages. I took Latin and Greek in High School and got A's and I guess it helps my vocabulary but I wish I knew French or Arabic or Chinese. I keep hoping to get time to study one of these - probably French because it is the easiest. I did Duolingo for awhile but didn't keep it up. Mark Zuckerberg amazingly learned Mandarin and did a Q&A with Chinese students - incredible. What is your opinion on bitcoins or cyptocurency as a whole? Also do you own any yourself? Bitcoin is an exciting new technology. For our Foundation work we are doing digital currency to help the poor get banking services. We don't use bitcoin specifically for two reasons. One is that the poor shouldn't have a currency whose value goes up and down a lot compared to their local currency. Second is that if a mistake is made in who you pay then you need to be able to reverse it so anonymity wouldn't work. Overall financial transactions will get cheaper using the work we do and Bitcoin related approaches. Making sure that it doesn't help terrorists is a challenge for all new technology. Maybe his thoughts have changed? That was a year ago. We are far closer to getting these digital currencies into the poor countries. It was a year of great progress. We are hoping to have India and Nigeria going in the next 2 years if things go well. Kenya and Tanzania and Bangladesh have grown a lot although those systems still need some improvements. Is it safe to choose a career in programming or will most coders below the expert level be replaced by automation solutions in the next decade? My deepest thanks for making the world a better place, in so many ways. It is safe for now! It is also a lot of fun and helps shape your thinking on all issues to be more logical. There is a prospect for change in this area for the next generation but that is true for most fields and understanding how to program will always be useful. Hello, Bill. As for the Reddit 's Secret Santa we know what present you've given this year. But we don't know what gift YOU have received from your Secret Santa. Can you tell us? It is quite a coincidence but my gift arrived this morning. 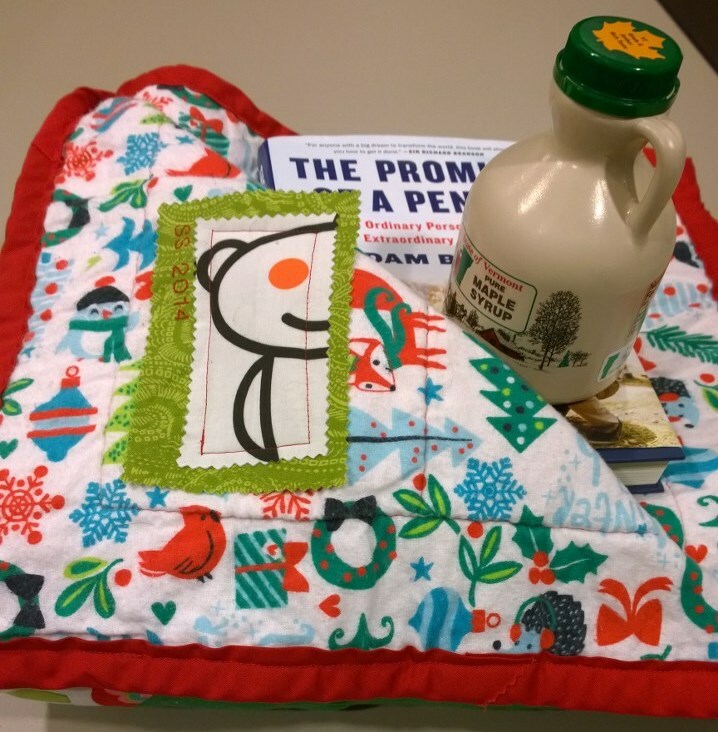 I got three cool things - a great quilt that a group of people did with a Snoo on it. A great jug of maple syrup and the book The Promise of a Pencil. All very thoughtful. Last year I waited and nothing came. EDIT 2: Reddit just let me know that I did get a gift last year: a generous donation to Heifer International, a great non-profit that helps fight poverty and hunger around the world. So, thank you /u/SailorKingCobra, my Secret Santa! EDIT 3: I’m jumping back into the thread to thank /u/bfarnsey for the generous gifts. The quilt is amazing! /u/sillygirlsarah made it in just a week—I don’t know a ton about quilting, but I understand that’s really fast. The Snoo on there is a very nice touch. To show my appreciation, the quilt is being featured as my cover photo on Twitter and Facebook. The Promise of a Pencil looks interesting. It touches on two key areas: improving education in the developing world and inspiring talented young people to get involved with global issues. Adam Braun’s story is a good one and I’m eager to learn more. Who doesn’t love maple syrup? Especially from Vermont. A nice personal touch given that this is the kind /u/bfarnsey grew up with. Thanks again to a terrific Secret Santa. What do you think has improved life the most in poor countries in the last 5 years? Vaccines make the top of the list. Being able to grow up healthy is the most basic thing. So many kids get infectious diseases and don't develop mentally and physically. I was in Berlin yesterday helping raise $7.5B for vaccines for kids in poor countries. We barely made it but we did which is so exciting to me! Although you are a billionaire do you sometimes buy generic products over brand-name ones? If so, what are the products that you buy? I am pretty basic when it comes to clothes and food. My big splurge is having a plane to fly around in. I play tennis so I invest in shoes and racquets to help but they don't make a big difference. Hi, Bill. Dry rub or sauce on your BBQ? Sauce. Lots of sauce. I always spill a bit so I avoid BBQ before TV appearances. 2015 will mark the 30th anniversary of Microsoft Windows. What do you think the next 30 years holds in terms of technology? What will personal computing will look like in 2045? There will be more progress in the next 30 years than ever. Even in the next 10 problems like vision and speech understanding and translation will be very good. Mechanical robot tasks like picking fruit or moving a hospital patient will be solved. Once computers/robots get to a level of capability where seeing and moving is easy for them then they will be used very extensively. One project I am working on with Microsoft is the Personal Agent which will remember everything and help you go back and find things and help you pick what things to pay attention to. The idea that you have to find applications and pick them and they each are trying to tell you what is new is just not the efficient model - the agent will help solve this. It will work across all your devices. I would probably be a researcher on AI. When I started Microsoft I was worried I would miss the chance to do basic work in that field. How much of an existential threat do you think machine superintelligence will be and do you believe full end-to-end encryption for all internet acitivity can do anything to protect us from that threat (eg. the more the machines can't know, the better)?? Edit: I would just like to point out that second part of my question went unanswered. That would be a great discussion for us all to have, especially given the myriad of other vulnerabilities presented by lack of encryption (eg. overzealous government, hackers, etc.). I am in the camp that is concerned about super intelligence. First the machines will do a lot of jobs for us and not be super intelligent. That should be positive if we manage it well. A few decades after that though the intelligence is strong enough to be a concern. I agree with Elon Musk and some others on this and don't understand why some people are not concerned. Hello Mr. Gates, I admire the work you've done to eradicate diseases such as polio from the world. What can we do as citizens to help keep these diseases gone for good? Polio eradication is a big focus for me. Our last case in Africa was 6 months ago and we are hoping no more show up. It takes over a year to be sure. We still have cases in Afghanistan and Pakistan. Until we get rid of it there it can spread back to other countries. Pakistan is starting to take this seriously including the army and the government. They need to do the same things that were done in Nigeria. The Taliban makes it very difficult. They have killed women going to vaccinate kids many times. Hi Bill, what is a life lesson you learned the hard way? Don't stay up too late even if the book is really exciting. You will regret it in the morning. I am still working on this problem. Technology is not making people less intelligent. If you just look at the complexity people like in Entertainment you can see a big change over my lifetime. Technology is letting people get their questions answered better so they stay more curious. It makes it easier to know a lot of topics which turns out to be pretty important to contribute to solving complex problems. I was watching a video last night on Thorium reactors and saw that you were also in the video discussing this topic as well. This is a technology that I have been following because it makes so much sense. My question is, how feasible is the technology at this point in your view and how long before we will see that technology in practice here in the US? Right now there isn't enough R&D going into safe and cheap nuclear energy. I am supporting Terrapower which has a 4th generation design that looks good. It doesn't use Thorium - it uses the 97% of Uranium that normally can't be used for a reactor by breeding and burning. This means fuel will always be cheap. There are a lot of innovations but the key one is that it is far far safer than anything today - not relying on human operators. What innovation has been brought to you but sadly never worked out for what ever reason, but you really wanted it to work? Thanks! And keep being awesome! So far we have not being able to use technology to connect people to the needs of the poorest in countries that are far away to tap into their empathy. I think this can be done but it needs some missing creativity. Sewage is a problem. Since it costs money to process it just gets dumped in slums in poor countries. The system the rich world uses of pumping in clean water and pumping it to a processing plant is too expensive. I challenged engineers to create a processor of sewage where the costs could be covered by the energy and water (clean water) that it outputs. We have made progress on that. One team, Janicki, which was written up in Wired, is send a prototype machine to Senegal later this year. Getting rid of sewage helps a lot to reduce disease and improve living conditions. This is an easy question. I am good friends with Paul Allen who owns the Seahawks and I live in Seattle. The playoff game was amazing to watch. Go Seahawks! Regarding the video of you drinking the ... uh.... poop water, how long will it take to put something like that into a community where they can start seeing immediate results? And if I totally missed it, where are they currently setup and what kind of benefits has it already provided. Besides clean drinking water, that is. The timeframe is longer than I would like. Probably 5 years before we have hundreds of them out in dozens of cities but we can scale up fast after that. As there are so many great philanthropic causes, how did you and Melinda decided on the causes that you wanted to put the majority of your effort? There are a lot of great causes. It is important not to be frozen trying to pick since it is important to specialize and really learn the area you are trying to help. We picked health inequity as our global thing and educational inequity as our national thing and most of our projects fit into these areas. Part of the beauty of philanthropy is the diversity of causes and approaches that get tried. It is far more risk oriented than government or private sector spending which makes it special when it is done right. Do you have a pet? If so what's his/her name? We have two dogs. 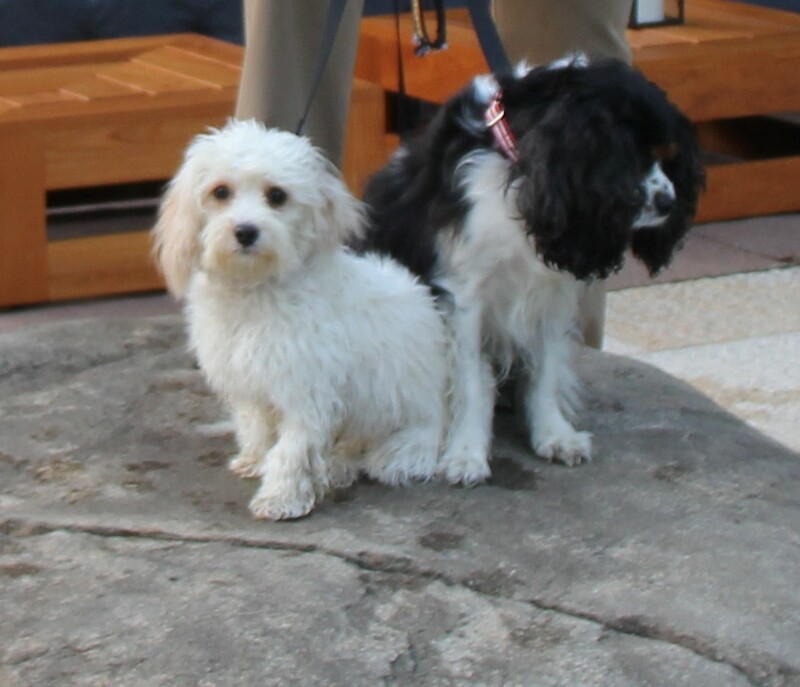 One is Oreo and the other is Nilla. I will say I spend less time with the dogs than the kids do but I really like them (when they are not barking at night and not eating things they are not supposed to and when they are well house trained). I have resisted getting a third dog. Hi Mr. Gates! Thanks so much for coming back again, I missed your last 2 AMAs. What do you think is the hardest challenge that the Bill and Melinda Gates foundation is currently facing? We have some tough scientific challenges like an HIV cure. However the toughest thing is helping teachers learn from the best teachers. There are great teachers and the kids who get them are lucky. We should be able to spread those skills but the current system doesn't do it very well. Mr. Bill Gates, what is your favorite expensive food? Nathan Myhrvold has some amazing modern cuisine stuff that is super tasty. I am not a foodie but his new concoctions are amazing. I also like Thai and Indian food but it doesn't have to be expensive. One of the themes in this year's Gates letter is helping to improve agricultural practices in Africa. As a person who was raised in an agricultural community in Canada, the ideas you presented really resonated with me. As individuals, is there anything we can do to help Africa achieve food security? Government aid funding from rich countries to develop new seeds and help the countries educate their farmers and provide credit to them can make a huge difference. Canada does some of this like the United States. We need to raise African productivity by 1.5 to 2x in order for them to avoid malnutrition and be able to lift themselves out of poverty. It is strange a continent with 70% adults as farmers imports food from countries like the US with 2% farmers. Africa spends $50B net buying food today. With productivity improvement they can offset the weather getting worse and feed their children enough to thrive. Thank you for doing this AMA! I really look up and admire you in many different ways. It’s quite an honor just to be able to ask you a few questions. What do YOU think about the new Hololens? Have you tried them out yet? What fields do you see really opening up to big potential in the computer industry? I really love computer programming. I’ve done it since I was 12. I’m 17 now and find myself worrying about what to declare as my major in college. I’m afraid that whatever my major is will become obsolete within 5 years. What are some awesome books you’ve read lately? Do you think this new poop water machine will make its way into first world countries? I think California could greatly benefit from it since we always seem to be in a drought. Do you ever talk to Steve Wozniak? How are you? What’s new? Have anything fun planned? The Hololens is pretty amazing. Microsoft has put a lot into the chips and the software. It is the start of virtual reality. Making the device so you don't get dizzy or nauseous is really hard - the speed of the alignment has to be super super fast. It will take a few years of software applications being built to realize the full promise of this. If you study programming and biology and see how the programming can help biology you will stay out on front! Thanks for doing the AMA. I am a great admirer of your philanthropic work. My question for you is regarding medical research funding. I know your foundation focuses largely on global health issues, but do you have thoughts on research back here in the USA? Governmental funding is reaching dangerously low levels, and many bright and talented clinicians and scientists aren't even applying for federal grants knowing they have little chance of being funded. What can we do about this? As an aside, I am about to launch a non-profit dedicated to crowdfunding individual medical research projects. I'm working with little entrepreneurial experience or backing but a ton of passion and experience in the healthcare field--do you have any suggestions or is there anyone at your foundation who might take a few minutes to offer some advice? Edit: whoops. Reddit ate the end of my post. Research is very underfunded compared to the ideal. Society captures so much benefit from innovation that inventors don't so there is not enough risk taking. Government (and Foundation) funding of research helps but it still should be more. The United States funds a lot more than any other country even relative to its success. It should do more medical and energy and educational and other research. Politicians often think short term unless the voters tell them to avoid that. Perhaps the most outrageous thing is we have not raised Energy research funding to help solve climate change! Hi Bill. What's your favorite spread to put on bread? Butter? Peanut butter? Cheese spread?